Here’s a new panel to add to your tool chest. It’s one I expect to use almost daily and save approximately 3.1 hours of typing over the next year. Hopefully you’ll find it useful as useful as I think it is. Yuck! Clipping instead of a scrollbar. So how do you get the desired behavior? So what’s wrong with a Grid? Grids take more lines xaml to create. 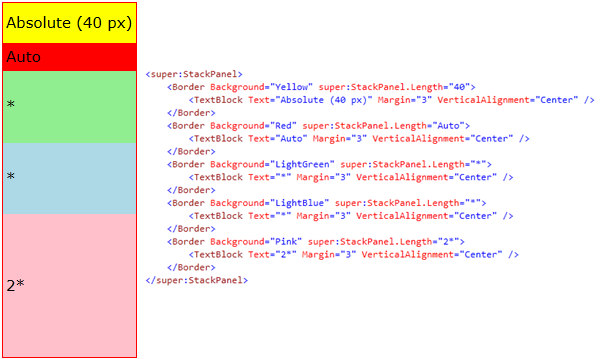 Compare the StackPanel Xaml to the Grid’s above and notice the 4 extra lines of Xaml. Ok, not a huge deal but if you’re doing this every day like me, you start to get sick of creating RowDefinition and ColumnDefinition objects. With a grid you have to explicitly define the order of the children. Adding the attached property Grid.Row is easy on your first pass but what happens if you want to insert a new row somewhere in the middle. You not only have to add a new RowDefinition, but you also have to remember to go increment the row number on all subsequent siblings. This is a pain and error prone because a sibling would potentially be defined in any order in the grid. Wouldn’t it be great if you could get the best of both worlds? What we really want here is a StackPanel that allows you to define the size of the children. Just set the attached property StackPanel.Length to “*” to get a child to stretch. Have I sold you yet? The nice part is that SuperStackPanel is completely compatible with a normal StackPanel. Just swap out your StackPanel for SuperStackPanel and everything will look the same because the default value of Length is “Auto”. Frankly, I’d love to see Microsoft expand the role of StackPanel to support this natively. Of course, until then, there’s SuperStackPanel. 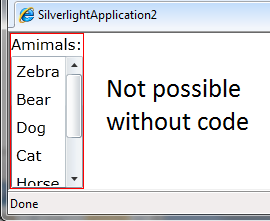 SuperStackPanel is lightweight and simple to add to your project, just download the C# source code, add to your project, add the namespace to your xaml and away you’ll go. Enjoy!